Although Proust is shelved (Penguin, Flammarion, Moncrieff, Shattuck, de Botton), putting him away is more difficult. I decided to read The Museum of Innocence by Orhan Pamuk as a palate cleanser between ISOLT and Project D. And what do I find myself reading? Themes of love, jealousy and desire; a pages-long description of a society party; an analysis of the upper crust of Istanbul society; the creation of a museum of memories which trigger moments of a compulsive love affair. Coincidence? or a permanent change in the way I look at the world? lxp–I, too, see the similarities between ISOLT and The Museum of Innocence. I think it would be fair to describe Pamuk’s book as Proustian, though I haven’t read Museum of Innocence recently. Your post makes me want to pick it up again. 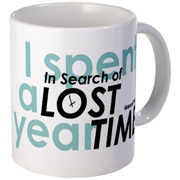 I find I am also not straying far in a respite from reading Proust. I have the new assemblage of Montaigne, Sarah Bakewell’s How to Live, which seems to cast constant revelation on Proust. So much of Proust seems to me cloud, the condensation of sharp pictures, precise moments and illuminations,refractions within his greater effort to convey the flow of mind throughout life. The design of the whole might be simply the kaleidoscopic point of perspective, shift that and all falls apart. How to Live quotes Montaigne – “It is a thorny undertaking, and more so than it seems, to follow a movement so wandering as that of our mind, to penetrate the opaque depths of its innermost folds, to pick out and immobilize the innumerable flutterings that agitate it.” A pleasure of this book on Montaigne is tracing the quotes Bakewell uses in her study back to Montaigne’s original essay – where Montaigne goes on to say, in an essay on the impossibility of practicing one’s death, on his own close encounter with death and on his study of himself as the object of his thoughts, “There is no description equal in difficulty, or certainly in usefulness, to the description of oneself. Even so one must spruce up, even so one must present oneself in an orderly arrangement, if one would go out in public.” I do see Proust, rising exhausted from his narrow bed, to dress in evening clothes and extra mufflers for one of his forays. Dennis — Have you ever contemplated keeping this blog “open” for ongoing discussion and as a refuge for those of us having trouble disengaging from the daily immersion in Proust? Probably not practical. . . .
I’m surfacing very slowly from ISOLT. It’s taking me a long time to get clarity and perspective. I finished the book at 38,000 feet and I’m struggling to get that 38,000-foot perspective on the whole experience and, more pointedly, on where I take it next. I’m now starting to turn to the background material I didn’t have time to read during the year and I expect to be pretty consumed in the course of the next year re-reading some of ISOLT and digesting the biographical and critical material you’ve shared with us. What I find myself thinking most about at the moment is Proust’s treatment of death and how abruptly and brutally he takes his characters from us. How tough and spare his prose is over Albertine’s death — the constant dirge of “She is dead.” How Swann and St. Loup are mercilessly yanked from the stage with no warning or mourning. The sudden and frightening aging of Odette. The utter disappearance of his father and, at the end, of his mother. I’m haunted by Proust’s powerful command of death and loss. Magnificent. 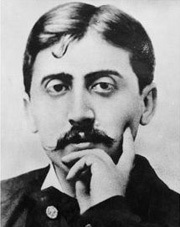 I don’t think the blog is going to be “closed.” It will remain open both for first-time readers of Proust and those of us who still wish to share thoughts, perspectives on their Proust experience.